"Time for Tea" Collection is just like it sounds! Take the time to pour yourself a cup, browse through this Collection and revel in the beautiful flowers, tea sets and accompanying items. Doesn't it give you that warmth that only a cup of tea on a cold day can do!! No need to worry about spills, it magically cleans out! 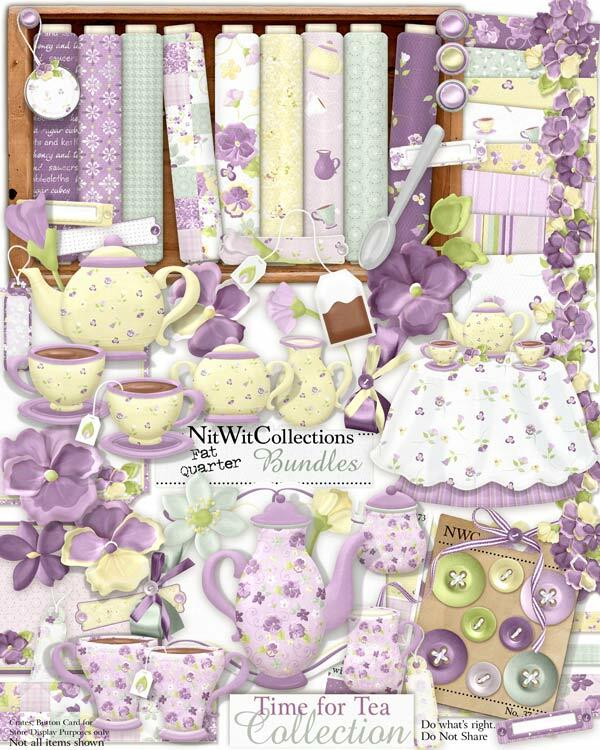 **Don't miss the Lil Bits "Time for Tea" that co-ordinates with this FQB for even more creative ideas. 1 Border of flowers that will make any gardener jealous! 2 Bows wrapped up - maybe a good gift idea for me?? 1 Round Tag - would make a great tag for a tea bag...no? 1 Tea bag - you would think 1 wouldn't be enough for the party, but I assure you this one will! 1 Teaspoon - we are all good at sharing aren't we? ?